Dramatically improve the look of your custom bagger with Bad Dad's 905 Floorboards and save a few dollars when buying the complete kit. 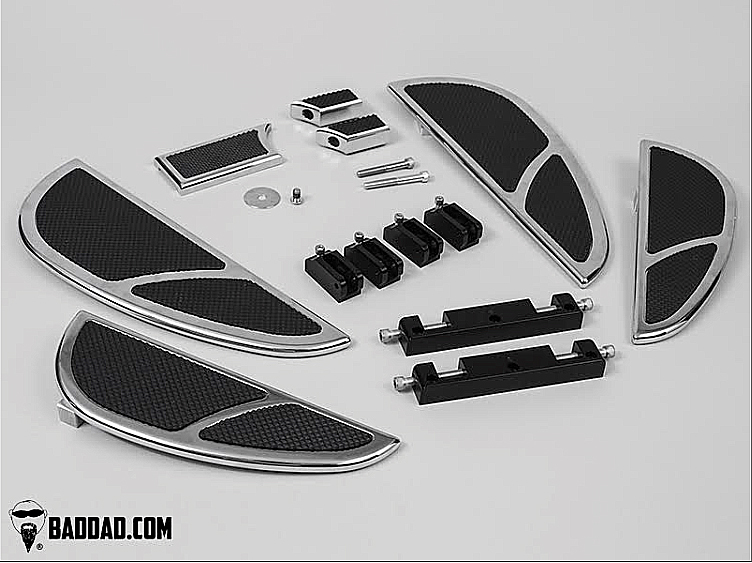 This complete kit includes Driver Floorboards, Passenger Floorboards, Brake Pedal, and your choice of Single or Dual Shift Pegs. All mounting hardware is included with this complete package. Front Floorboards: Boards measure 15-3/8" long, 5-1/4" at widest point, and are cut from 1/2" billet. Includes mounting brackets & hardware. Passenger Floorboards: The 905 Boards are a complete replacement floorboard. Your order includes all of the appropriate mounting hardware for your bike. Note: The passenger floorboards in this kit are a direct bolt-on fit for all Touring and Softail models with existing passenger floorboards. Touring models with passenger pegs will also need to use Harley-Davidson part number 50500042. Softail models with passenger pegs should use Harley-Davidson part number 50399-05 for 2000-2006 models and 50399-07A for 2007-current models.